The Rockets’ slide to the lottery continued Friday night, losing to the 3-8 Raptors 106-96. Houston now has the 3rd worst record in the league, behind the Clippers’ 1-12 and just barely under Philadelphia at 3-10. Sure, the Rockets have had a brutal road schedule to start the season, but if there ever was going to be a game that’s winnable, this one was it. Toronto’s Andrea Bargnani had an easy time getting to the hoop without Yao in the middle to guard the paint (and Luis Scola losing track of him to let him take it to the rack without any problem). It didn’t help that earlier in the day, the Rockets were dealt a psychological blow when they learned that Yao Ming will be out an additional two weeks because of a bone bruise that was found in his left ankle. I will have a more in-depth blog post about that in the next day or two. In the meantime, I’ll focus on Friday’s game. The main problem was rebounding (37 vs. 44), giving the Raptors 7 more field goals and points in the paint (36 to 44). And through a statistical rarity, the Raptors shot no free throws in the first half, but shot 30 in the second half! 30! Obviously some adjustments were made at halftime, either in the Toronto locker room to be more aggressive, in the referee’s dressing room after the refs reviewed some videotape, or a little bit of both. The Rockets only shot 16 free throws in the second half. And most importantly, the Rockets didn’t have anyone who stepped up late to hit big shots down the stretch. Kevin Martin statistically was great: 31 points on 8-of-16 shots and 4-of-7 from 3-point land, and hitting 11-of-11 free throws. The problem is that he, nor anyone else, made the big play when it counted: late in the 4th quarter after drawing close to the Raptors after Toronto had gone on a 15-5 run starting with 10:48 remaining and the game tied at 76. Andrea Bargnani showed how great of a player he is, scoring 26 points on 11-of-17 shooting. He’s almost Dirk-like, and his #1 draft pick designation a few years ago is looking like it’s paying off. He can shoot from the outside and drive to the hoop with ease (especially against the Rockets’ porous defense). I think when Bargnani took it strong to the hole like he did at least a couple of times, someone needed to step in and take a charge or foul him very hard to make him think twice about doing it again. That didn’t happen. The Rockets’ starters were okay, scoring 85 points. But when none of them step up to make plays in a tight game late, and the bench doesn’t come through, either, you’re going to have problems. Toronto’s bench outscored Houston’s 46-11. That’s pretty bad, but if you look at the stats, Toronto only got 6 points out of two starters (Jarrett Jack and Reggie Evans), and their bench played about 1/3rd more minutes (96 vs. 60). But still, for as hyped as the Rockets’ bench was before the season, that’s not good enough. We have to remember that Kyle Lowry and Brad Miller have been forced to become starters because of injuries to Yao and Aaron Brooks, so that’s a huge blow to the backup brigade. But clearly Chase Budinger, Courtney Lee and Jordan Hill haven’t lived up to expectations. And for some reason, Rick Adelman decided not to play Jermaine Taylor after a good performance against Oklahoma City (8 points). Go figure. I think I have come to realize what could be another source of the Rockets’ problems (they have many) these days. I’ll tell you in a second after setting the table here. I think this is a little too vague. Adelman says that no one is “stepping up.” I can understand if that means they aren’t making open jumpers. But if it means having a player, like Battier said, who can “break somebody down and get a good quality shot,” well, if they don’t have that, then they have to go to the alternative: “running good offense.” That’s on the coach. If players aren’t following his instructions, then he needs to give more time to players who will. Up until this time, I thought the problem was the injuries to Yao and Brooks. That’s a big part of it. But if you don’t have your top guys, then at least run plays that don’t expose the Rockets’ weakness to break anyone down or puts them in a position to put shots up under ‘duress.’ Is Adelman being exposed here? Honestly, I think the players may have tuned him out. You don’t ever hear them talk about how he’s a great coach and they believe in the ‘system.’ I think Adelman has relied too much in Houston on the players to make plays. In Sacramento, it seemed like he had this great offensive system that was unstoppable. But he also had great players: Webber, Peja, Bibby, Vlade, Miller, Doug Christie, Bobby Jackson (am I missing anyone?). I think the players could benefit getting motivated by a coach who can get them to play with more aggressiveness (offensively or defensively), and Adelman isn’t that kind of guy. I really like him as a person. Class guy. But I just don’t see the fire like you see from a Scott Brooks (Oklahoma City), or the constant strategic thinking during the game. I was really impressed with Chicago’s Tom Thibodeau when the Rockets played the Bulls last week. We all knew he would be a good head coach when he was in Houston, and it looks like that’s turning out to be the case. I can understand that coaching alone can’t get you to the playoffs — you need guys who can win games based on their talent. But I would expect that good coaching can help you win 30-40% of your games if given a good roster of players like Houston supposedly has. Right now the Rockets have only won 25% of their games (3-9). So I think there has to be more scrutiny on the head coach because up until this time, there hasn’t been any. What do you think? – Brooks should get a lot more respect from his haters when he comes back. The Rockets have obviously missed him. But they were losing close games with him in the lineup as well, so I’m not sure if he alone will fix their late-game execution problems. – Maybe this year will be the Rockets’ “Tim Duncan year” like the Spurs had when they were a good team on paper, but had a terrible record mainly because their big man David Robinson was out most (or all) of the year because of injury. After drafting Duncan #1, they roared back and built a dynasty. At this rate, there’s a high probability the Rockets will get a great lottery pick. I sure hope the draft is strong next year. I’ll be paying more attention to college basketball this season because of the Rockets’ woes. Wednesday night’s game is going to be a war considering the Jazz have won 8 games in a row, are only 1.5 games behind Houston, and the Rockets have won 8 of their last 9 games after they beat Toronto 107-97 Tuesday night at Toyota Center. It didn’t look like it would be easy as the Raptors came out and hit tons of outside shots, led by #1 draft pick of 2006 Andrea Bargnani, who gave Yao fits as he drew him out to the 3-point line. That was going to be challenge for Yao, who is more comfortable parking himself in the paint. It’s not that Yao played terrible defense, in my opinion, it’s just that a 7’6″ guy can’t get in the face of someone like Bargnani who can put it on the floor and drive past him. On the flipside, Bargnani had to defend Yao down low in the paint much of the time, and you’d think that would be no contest given Yao’s size advantage. But he started off slow, only making 1 of his first 5 shots. However, the mismatch worked in his favor over the course of the game as he hit 6 of his next 7 shots, and would finish with 20 points on 9-of-16 shots in 31 minutes. He also had 11 rebounds, 2 assists, and 1 block. But he also had his obligatory 5 turnovers. Yao scored 20 points and grabbed 11 boards as Chris Bosh could only look on. Click here for more photos from the game. Giving Yao a little more rest than usual was Carl Landry, who played lights out in scoring a career-high 22 points on 7-of-9 shots, hit all 8 of his free throws, grabbed 6 boards and blocked 2 shots in 31 ½ minutes. Landry is really making an impact after having missed 4 games and then coming back against Minnesota Sunday night and scoring 12 points on 4-of-5 shots. Just think if he had been healthy against Chicago to help prevent the 4th quarter choke job, the Rockets might be on a 9-game winning streak right now and a little closer to San Antonio in the standings for the Midwest division lead. As much as the media is raving about Landry’s play, which is much deserved, Luis Scola continues to play at an amazingly high level and has turned into the player I knew he would be when the Rockets got him before last season. Scola, always fun to watch, scored on an array of shots on his way to 20 points on 10-of-17 field goal attempts, 16 boards, and blocking a shot. Scola has now racked up 23 double-doubles this season, and has had 8 in his last 9 games. I think Scola is so valuable, I am nominating him to be the 3rd piece of the Rockets’ “new Big 3.” After all, his fellow countryman Manu Ginobili is part of the Spurs’ Big 3 that includes Tim Duncan and Tony Parker, so why shouldn’t he? I think he’s just as deadly, but in a different way down low. Von Wafer was huge in the fourth quarter as he scored 8 of the Rockets’ 10 points in one stretch, which included two 3-pointers in a row that gave the Rockets a nice cushion headed into the game’s final minutes. He would finish with 14 points, thanks to pushing the tempo, and also dole out 3 dimes. Well, my first game back covering the Rockets again on Yao Ming Mania was a complete disaster. The Rockets’ play was ridiculous in the first game of their road trip, getting their clock cleaned 94-73 by a 12-20 Toronto team. A team that also happened to lose their starting point guard Jose Calderon to a hamstring injury in the second quarter. The Rockets have now lost 4 of their last 6 games, most against poor teams. If they keep playing like this, something major HAS to happen – like a big trade or a firing. This sort of play is completely unacceptable. Tracy McGrady started the game with a plan to play only one game in each of their 3 upcoming back-to-backs. He was terrible again, hitting only 2-of-9 for 4 points in 28 minutes of play. He also had only 2 rebounds and 2 assists. In his past 5 games, he has only made 15 of his last 54 shots for an average of 10 ppg. Yao Ming started the game scoring 6 of the Rockets’ first 10 points, but after that, the Raptors swarmed him and forced others to make shots. That strategy worked for Toronto because he got no help from the guards, who shot 3-of-15 in the half. That gave them a 39.5% shooting percentage as the Rockets trailed 38-28 at the half. They also scored a season-low 14 points for a quarter in the first. Yao Ming double-pumps in mid-air over Toronto’s Rasho Nesterovic before shooting the ball toward the basket, which bounced around the rim for a bucket in the fourth quarter. 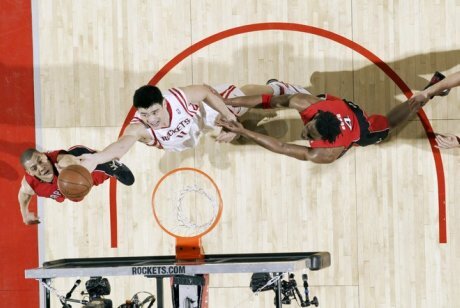 Yao led the way in the fourth quarter with 8 big points, and would lead all scorers with 25 points on 8-of-19 shooting, and 9-of-9 from the free throw line, to give Houston a 91-79 victory over the Raptors. 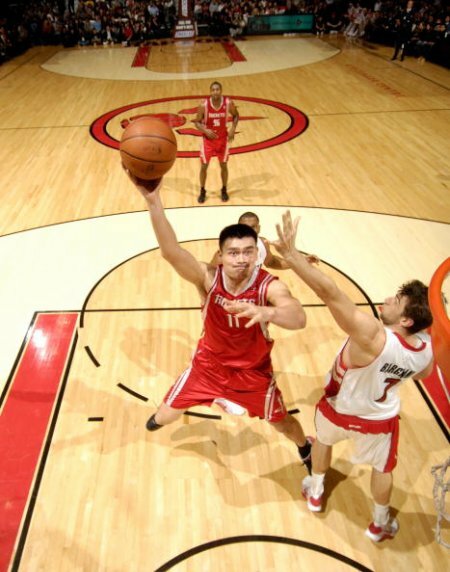 At the 6:43 mark in the fourth, Yao calmly hit a turnaround jumper to make it 76-70. On the next possession, he elevated for a jump shot from just outside the left side of the lane, double-pumped in the air (pictured above), then threw up a shot that rattled on the rim a couple of times and dropped through to make it 78-72. When you’ve got a soft shooting touch, you’re going to get some nice bounces on the rim that will fall your way. Yao Ming shoots a hook shot over Toronto’s Kris Humphries. The Rockets played poorly in the second half, with Yao taking only 10 shots (while McGrady shot 21) and scoring 15 points in a humiliating loss, 93-80. After the way the Rockets half-assed their way to a sorry loss against an average Toronto Raptor team Sunday afternoon, someone high-up in the organization needs to rip this team. It most likely won’t be head coach Rick Adelman because he has proven to be too easy going to do that. Maybe owner Leslie Alexander? In the second half, this veteran Rocket team was outclassed by a bunch of Toronto bench guys, and thoroughly embarrassed as the Raptors scored 59 points in the second half vs. just 35 by the Rocks. You expect All-Star Chris Bosh to get his points, even if this was his first game back in 5 games because of a groin injury. Bosh scored 21 points (16 points in the second half), grabbed 10 boards, and blocked 4 shots. But when you’ve got bench players like Kris Humphries scoring 16 points, Jason Kapono scoring 10, and Carlos Delfino scoring 12, you have to do some soul-searching on if you’re really the better team or not. Yao Ming gets ready to throw one down Friday night in Toronto after a beautiful T-Mac pass to him down low. Yao started off slow, but ended up having a great night, finishing with 23 points and grabbing 12 boards in a 114-100 victory. Click here for more photos from the game. Many times Jeff Van Gundy will say that getting payback against a team should not be a motivating factor for teams. Instead, a game should be played without much regard for what has happened in the past, but to do what is expected of you and focus on the task at hand. That may be true. But it’s hard to believe that was all that was involved with what we saw Friday night for the Rockets in Toronto. Here are the facts. Tracy McGrady had another outstanding game against his former team (22 points, 6 rebounds 5 assists), the team he averages the most points against. Rafer Alston almost had a triple-double (23 points, 9 assists, and 8 rebounds) against the team that traded him before the start of last season (if he keeps playing like this, the rest of the league should watch out–the Rockets will be title contenders. But that’s a big ‘IF’). And Houston came out fast in the first quarter and built a huge 22-point lead in the first half, making a statement against the same Raptor team that had spanked the Rockets 106-90 on February 28th in Houston. This time it was the Rockets’ turn, beating Toronto 114-100 in their own gym. And this isn’t the first example of the Rockets getting payback. Just 9 days ago on March 7th, the Rockets came out with a vengeance against Boston to redeem themselves for a collapse against the Celtics eight days prior. Another reason was because this was the first time Yao Ming had the opportunity to inflict pain on the Raptors in over two years, with the Raptors having won all 3 of those games since. Yao didn’t score the 40 points or grab 10 boards like he did on December 20th, 2004. But he did get a double-double in this one, scoring 23 points on 8-of-18 shooting, and grabbed 12 boards. Yao does some special exercises to rehab his injured leg before Wednesday night’s game in Houston against the Toronto Raptors. Click here for more photos from Yao’s workout before the game. The Rockets cannot wait for Yao to return to the lineup since the Rockets were blown out by an improved, but much younger, Toronto team. It looks like the wheels are starting to finally fall off in Houston without Yao in the lineup. The Rockets lost their 3rd game out of their last four, this time to the Toronto Raptors at home Wednesday night 106-90. Sure the Raptors are much improved, leading the Atlantic division with a 31-26 record and having won 9 of their last 12 games. But we’re talkin’ about the EAST! The Rockets other two losses in their last four games were to Eastern Conference cellar-dwellers Atlanta and Boston. May day, May day! Now all they have to do is lose to Milwaukee on March 26th in Houston, and they will have pulled the trifecta of losing to the teams at the bottom of the three divisions in the East. The Raptors jumped out to a 27-21 lead in the first quarter on 13-of-22 shooting. Then in the second quarter they shot even better — 80% to score 40 points! Yes, I said 80%. 16-of-20. The “80-40” rule must have been in effect: shoot 80%, score 40. In that slaughterhouse of a second quarter, rookie Andrea Bargnani hit 5-of-5 (including 3-of-3 from three-point territory), Jose Calderon made 3-of-3, Juan Dixon made 4-of-7 and Chris Bosh made both of his field goal attempts. Meanwhile, Houston didn’t shoot too badly. They scored 26 in the second quarter on 11-of-19 shooting. It’s just that their defense sucked. You know that if Yao had been in the middle, a lot of those shots would have been a little more difficult for the Raptors to hit. The Rockets made up some ground in the third quarter, outscoring Toronto 21-12 and cutting the deficit to 9 points. They could have made up more ground, but Chuck Hayes plain-and-simple blew two consecutive layup attempts at the rim. It was indicative of the frustration the Rockets have had lately with their shot. Then in the fourth, the Raptors went on a 10-0 run to extend the lead to 19, and that was the ballgame. Of course, just like the previous game against the Celtics when they were trying to get something consistent going, Luther Head jacked up an ill-advised three-pointer without ever having moved the ball around. Then on the next possession, John Lucas jacked up a trey and missed. By the end of the fourth, the Rockets missed 6-of-7 three-pointers in the quarter (sound familiar?). For the game, they missed 14-of-21 treys. Better than against Boston, but still not good enough. Meanwhile, for the game Toronto shot 8-of-17 from behind the arc, and hit 57% of their shots for the game. The only thing that was more insane than Toronto’s shooting was this remark by the indelible Clyde Drexler, who topped his previous winning remark a couple of weeks ago when he said that Rafer Alston is a “great finisher” at the rim when Van Gundy has publicly stated that’s Alston’s biggest weakness, and everyone knew that already. With about 4:50 remaining in this game and the Rockets down by 21 points, Clyde “the Cliché” Drexler said, “There is plenty of time” for the Rockets to make a comeback. Did this guy play the game? Hard to believe it. Just as hard to see the Rockets go down in flames at home against teams they should beat. Sorry, I have to vent toward someone, and Clyde just happened to pass through my crosshairs tonight. Yao can’t return soon enough. FRIDAY, 1/6/05 – What else is there to say? I have said it over and over and over again this season. If there was ever any proof that the Mike James for Rafer Alston trade on October 4th was an idiotic move for the Rockets, this was it. While James was lighting up the Rockets for 30 points, eight assists and 7 rebounds, Alston scored TWO points and 7 assists in 35 minutes in a blowout loss to Toronto, 112-92. Good for you, Mike. You proved how idiotic the Rockets were in trading you. Who is accountable for the Rockets for this dumb move? I want to know. Hey Mike, will you consider coming back to the Rockets after you become a free agent this season? The only bright notes for the Rockets was T-Mac ‘s 37 points (15-of-31 shooting) and David Wesley‘s 19 points on 7-of-12 shooting. It didn’t help that Juwan Howard got upset at James for jawing at him after he was fouled, and shoved the ball in his face to get thrown out of the game. That was about as dumb of a move as the aforementioned trade. That’s about all I can write after this game since I’m still on the road. Hopefully with my travels ending soon, I will be able to get back to my regular schedule of providing more extensive reports of Rocket games. WEDNESDAY, 12/21/05 – With all the injuries that have piled up for the Rockets — including two more in their game against the Toronto Raptors (Moochie Norris and Stromile Swift) – the Rockets were going to have to play almost perfect basketball to win Wednesday night…even against the 5-20 Toronto Raptors. They did themselves no favors by turning the ball over 14 times, T-Mac struggling offensively (7 points on 2-for-11 shooting), their defense giving up 49% shooting (43% from three-point land), only shooting 42% themselves, and making only 12-of-17 free throws. With so little room for error and the Rockets not playing up to the challenge, they lost easily to the Raptors 94-81. Meanwhile, former Rocket Mike James scored 19 points (50% shooting, 5 assists) and haunted the front office who traded him for Rafer Alston before the season started. With that kind of scoring punch — if he hadn’t been traded –maybe the Rockets would have had a chance tonight, and wouldn’t have lost 8 games this season without T-Mac in the lineup. To make matters worse, Swift was kicked in the groin by Toronto forward Chris Bosh, forcing Stromile to miss the rest of the game. Replays clearly showed that Bosh didn’t go to great lengths to keep his foot from going upwards as it approached Swift’s groin. I think on plays like that, the refs should be more courageous and call a foul. This was no accident, folks. It didn’t help the Rockets to not have Swift out of the lineup given all of their injuries to their big men (Dikembe Mutombo and Yao). Fortunately Juwan Howard had one of his best games of the season (8-for-14, 21 points), but it wasn’t enough. The Rockets looked their best in the second quarter when they shot 12-of-20 (60%) and scored 27 points. With the absence of so many players, the Rockets role-playing guards stepped up and showed some heart, like Luther Head (4-of-5 for 9 points), Moochie Norris (4-of-6 for 8 points), and David Wesley (4 points), including a spectacular steal that carried Wesley into the announcers’ table and assist to Head for a layup. The only problem was that the Raptors scored 27 points themselves in the second quarter, giving them a 48-43 lead at halftime. The second half is when the Raptors pulled away while the Rockets only shot 14-of-41 from the field, with T-Mac going 0-for-5. After making a vow a day earlier that he was going to step up and take on more of the load like he did in Orlando and score lots of points, it’s strange to see him not come through. I guess he’s human after all. You are currently browsing the archives for the vs. Toronto category.